This is a wonderful blog about meeting an author! 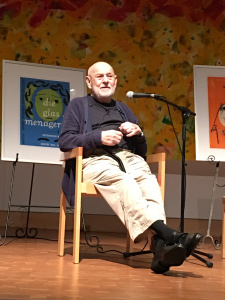 Last week I met Eric Carle. Let me say it a little louder, “Last week I met Eric Carle!” The man, a world renowned children’s author and illustrator, is 88 years old. His history is fascinating. So is he. My author bucket list started to grow when Peter Spier died this year. His Star-Spangled Banner, Circus, and Rain books have been staples in my classroom for decades. I always meant to write and tell him so… His death was my wake-up call. And then I learned that Eric Carle would be speaking with Annie Lionni, granddaughter of Leo Lionni. Woah! 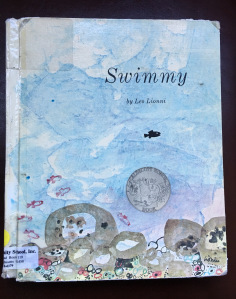 Leo Lionni, as in Swimmy, the first book I ever read aloud in my classroom. The book that changed my life in teaching. I thought I would reblog this wish for Writers! Earlier this month, the wonderful artist and blogger, Miss Gentileschi https://secretartexpedition.wordpress.com nominated me for The Unique Blogger Award. I admit that I sometimes take longer than I should in replying to such honors. For the delay, I apologize. For the honor, I thank Miss Gentileschi, and I recommend you visit her wonderful site. 1.) What (or who) inspired you to get into blogging? I have attended several writing conferences, and an emphasis was placed on having a web presence, so after investigations of possibilities, blogging was suggested as the best way to begin, and I agree. I have enjoyed both producing the blog and learning in the process. 2.) Describe your ideal three-course meal? A cheddar-beer soup, followed by a hearty beef stew, and finished with bread pudding. This is not the healthiest of meals, but it would be delicious. While I have never named any children after fictional characters, I have named several pets–cats–from characters in Shakespeare: Ariel and Miranda. I have tried to keep political discussion and commentary out of my blogposts, but there are times that demand commentary. Since World War Two, the U.S. Military has lead the way in integration, and today was a step backwards. Bigotry is justified by a fear of change, and such thinking must be challenged. This post on art in the Holocaust is extremely important. This is a wonderful post about learning from Stephen King! Stephen King wrote a seminal work on fantasy fiction writing—a memoir of the craft on writing by the same name: Stephen King: A memoir of the Craft – On Writing. When I decided to write fantasy fiction, instead of just dreaming about it, I decided the best place to start would be with Stephen King. Who better to learn from but a master fiction writer? So, I purchased his book in the year 2005, read it several times, high-lighted tantalizing concepts, tabbed with sticky writable tabs until I had outlined the entire book. I soon learned that reading about writing, tabbing every conceivable point of interest does not necessarily create a master fiction writer or even a mediocre fiction writer.